Bathroom Renovating - The Schedule - The Newcastle Bath Co. In the previous articles I have referred to the schedule of works that must be followed during a bathroom renovation in order to produce a bathroom that is up to the building code of Australia. 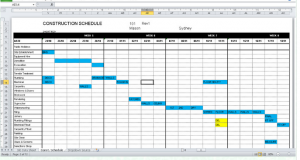 There is a logic to to that order and below are the details of the schedule and the reasoning behind it. Firstly, before any of the dirty work can take place, you will have to pick you design, tiles and PC items. Keep in mind that once and order is placed it can take 2-6 weeks to arrive, depending on your choices. Next comes the asbestos testing. Usually the asbestos company will be easily able to tell is asbestos is present just by looking. Occasionally a small sample is needed to send off to the lab. Sample testing takes around 3-4 days. Please see the earlier article regarding asbestos testing if you would like more information. After a quick visit to have your floors lined and the water disconnected to the bathroom,comes demolition. Depending on the size of the job, plus or minus asbestos presence, demolition usually takes one to two days. Plumbing and electrical ‘rough in’ follows. Rough in is the construction term for the all the works, such as moving plumbing and electrical that has to happen before the walls can be lined. Next is the sheeting or lining of the walls and ceiling, another 1-2 days. Now you will start to see your room take shape. Waterproofing now and this is one of the most vital steps to get right. Failing to get waterproofing done properly could land you with a leaky moldy bathroom in the years ahead. Waterproofing then needs a day or two to dry. Tiling at last. The most exciting part of the renovation, where you will see your plans and choices start to come alive. Remember smaller format tiles will take longer to lay (and as a result will cost a little more in labor). Then comes grouting and silicone sealing, again these small things need to be done well to give you a bathroom that lasts. All in all, tiling will take 2-5 days. Again it varies according to the size and detail in the work. Measuring up for your shower screen next. As all of our shower screens are custom cut, it takes about 7 day after measurement to installation. Measuring up can not be done prior to tiling as accurate measurements are necessary for a polished finish. A good lick of paint next, if it hasn’t already been squeezed in after sheeting and then it’s on to the electrical and plumbing fit off. This will see all of your lights, tap ware and PC items installed. Once the shower screen is ready, in it goes.Finally a good clean and you have your beautiful new bathroom. Enjoy!